Let Nothing Stop You from Smiling! Dentistry is all about having a confident, healthy, and beautiful smile, which is also important for patients wearing dentures. 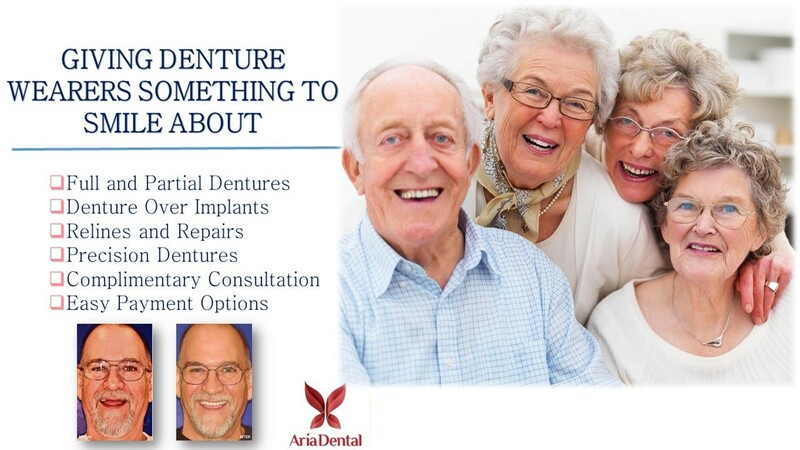 Aria dental of Mission Viejo provides personalized dentures service for individuals who lost their teeth for any reason. 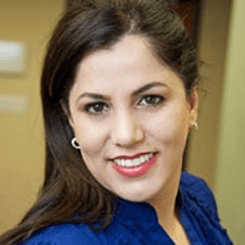 There are many different tooth replacement options, and it’s important to talk to Dr. Maryam Horiyat in person when making this important decision. 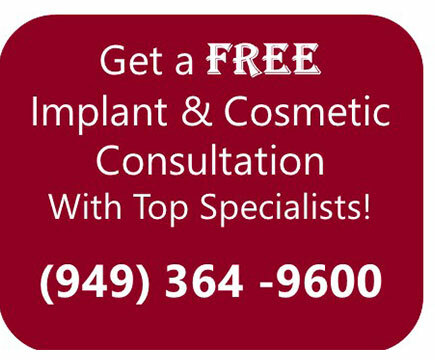 To get your customized, comfortable, and all-natural full or partial dentures and to restore the appearance and functionality of your smile, call us at (949) 364-9600 or of Mission Viejo to schedule an appointment today. Dentures are custom- made and removable prosthetic devices constructed to replace missing teeth. There are two main types of dentures: full and partial dentures. Full Dentures are given to patients when all their natural teeth have been removed; Partial dentures are designed to connect to your natural teeth. 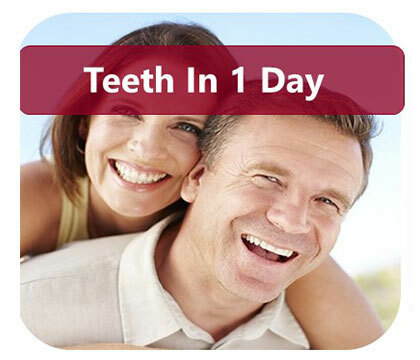 Are you tired of having loose denture while you are talking and eating? 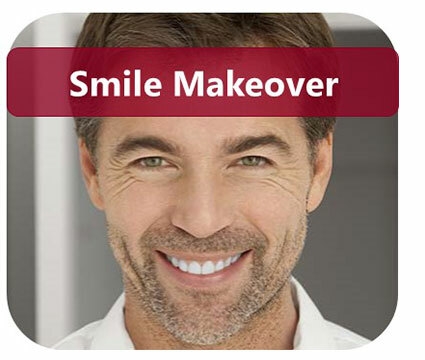 Or Are you tired of constantly relining your denture? If you wear dentures but want a more stable and comfortable denture, Dr. Maryam Horiyat and our team of American Board-Certified Periodontists and Implant Specialists can stabilize your dentures by fabricating a new denture or placing minimum two implants per arch. The more implants used, the greater stability and comfortable you get. 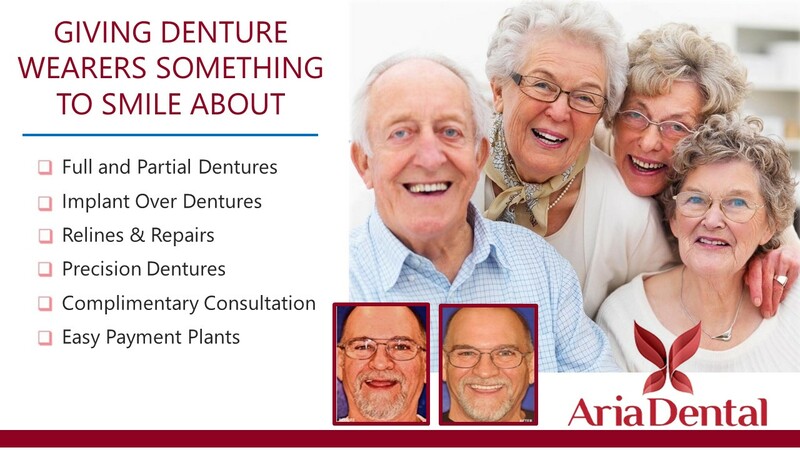 At Aria Dental, we offer numerous solutions to make your denture more comfortable. You should consult with Dr. Horiyat to learn about available options for your individualized case and choose the best one. 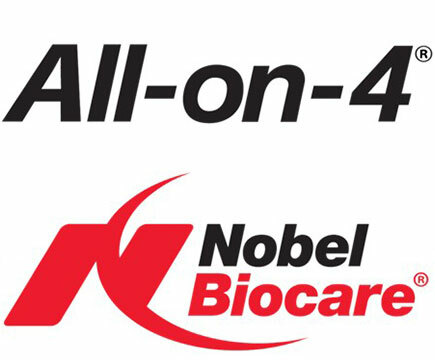 For a secure set of dentures that can function like natural teeth, Aria Dental also offers All-on 4®, implant-supported dentures, and denture stabilization, which are all excellent options with great benefits over traditional dentures. The general problem with dentures is that no matter how good the original fit, the denture itself wears away at the bone, causing continuous bone loss and requiring the dentures to be constantly adjusted. Eventually, there is no bone structure available for any denture to fit onto. 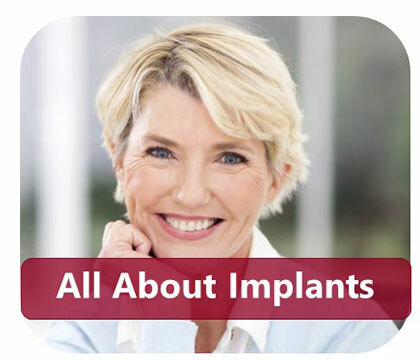 Implants can make them extremely secure and allow you to eat just about anything you desire and talk without trying to hold your loose denture with your tongue, cheeks, and denture adhesives. 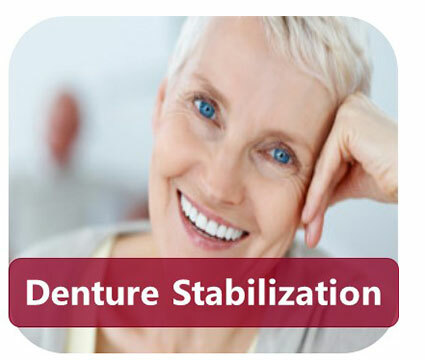 How Does Denture Stabilization Works? Dr. Maryam Horiyat fits your existing and new dentures with snaps that fit snugly onto dental implants. After placing your implants, you will be able to snap your denture in and enjoy an improved eating experience and quality of life and health.